The Cake Slice Bakers are almost finished with the wonderful Maida Heatter's Cakes book, with this month being the last for sets of recipes to choose from. Be sure to come back October 20th to see which recipe I choose for the final bake from this book! 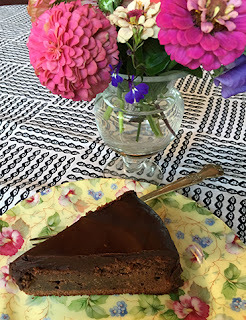 This month I chose the lovely Queen Mother Cake, a rich flourless chocolate cake with a chocolate ganache. 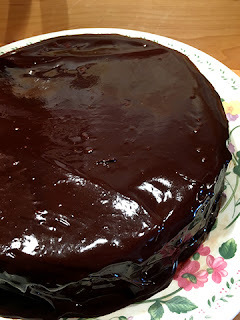 I wasn't really sure that I could make a nice ganache with soy creamer, but it worked beautifully and no one knew that I didn't use whipping cream. The original recipe calls for toasting almonds and grinding them in a food processor with sugar to create a fine flour. I've done this, but the particles of almond are variable. The flavor may have been different by just using the pre-made almond flour which isn't toasted, but the texture is then uniform, especially if you sift the almond flour as I do. I found that the soy creamer worked just fine instead of whipping cream for the icing. I used two-thirds of a package of Scharffen Berger's chocolate for the cake and the remaining third, plus 4 oz. semi-sweet chocolate chips for the icing. This worked well, too. You really taste the chocolate in this cake, so use the chocolate you most enjoy eating out of hand. The original recipe had some instructions for cooling the cake on a damp towel. I skipped that and let it cool for a while on a wire rack in the pan. This seemed to work just fine. I also baked it on Friday night for a Saturday dinner, so I wrapped the cooled cake up in a plastic bag, with the pan bottom still attached, and put it in the fridge until the next afternoon. That made it very easy to handle because the chilled cake wasn't at all delicate. I always make a mess and create a mass of crumb when I trim the top of a cake as called for in the recipe, so I skipped that step and iced it right side up. This is a rich cake. Small pieces are just fine. A bowl of berries (strawberries in my case) passed with the cake and some whipped cream are nice. The strawberries cut the richness a bit, for a thoroughly enjoyable serving of a very pretty cake. I already have requests to make it again. Be sure to check out the choices that my fellow Cake Slice Bakers have made. Look at the bottom of the post! Note: I don't have two stand mixer bowls, so I changed the directions so that I whipped the egg whites first. If you have two bowls, you can make the chocolate mixture, then whip the whites. Adjust a rack one-third up in the oven. Preheat the oven to 375 degrees F.
Grease the bottom and sides of a 9 x 3-inch springform pan and line the bottom with a round of baking-pan liner (parchment works well) cut to fit. Grease the paper. Dust the pan all over the inside with fine, dry bread crumbs. Invert the pan over paper, and tap lightly to shake out excess crumbs. Set the prepared pan aside. Place the chocolate in the top of a small double boiler over warm water on moderate heat. Cover until partially melted, then uncover and stir until just melted and smooth. Remove top pan from double boiler and set it aside until tepid or room temperature. Sift the almond flour into a small bowl and stir in 1/4 cup granulated sugar. Set aside. In the large bowl of a stand mixer, with clean beaters (I used the whisk attachment) beat the whites with the salt and lemon juice, starting on low speed and increasing it gradually. When the whites barely hold a soft shape, reduce the speed a bit and gradually add 1/4 cup granulated sugar. On high speed continue to beat until the whites hold a straight point when the beaters are slowly raised. Do not overbeat. Transfer the beaten whites to another bowl and set aside. Rinse and dry the stand mixer bowl. Put in the butter. Beat the butter until soft. Add the remaining 1/4 cup granulated sugar and beat to mix. Add the egg yolks one at a time, beating and scarping the sides of the bowl as necessary until smooth. On low speed add the chocolate and beat until mixed. Then add the almond flour/sugar mixture and beat, scraping the bowl, until incorporated. Stir a large spoonful of the beaten whites into the chocolate mixture to soften it a bit. Then, in three additions, fold in the remaining whites. Do not fold thoroughly until the last addition and do not handle any more than necessary. Turn the batter into the prepared pan. Rotate the pan a bit briskly from left to right in order to level the batter. Let cake stand on cooling rack until tepid, 50 - 60 minutes. Release and remove the sides of the pan. Do not cut around the sides with a knife - it will make the rim of the cake messy. Let the cake stand until it is completely cool, or longer if you wish. Scald the soy creamer or whipping cream in a 5-6 cup saucepan over moderate heat until it begins to form small bubbles around the edges. Add the dry espresso powder and whisk to dissolve. Add the chocolate and stir occasionally over heat for 1 minutes. Then remove the pan from the heat and whisk or stir until the chocolate is all melted and the mixture is smooth. Let the icing stand at room temperature, stirring occasionally, for about 15 minutes or until the icing barely begins to thicken. Stir to mix the icing and pour it slowly over the top of the cake, pouring onto the middle. Use a long, narrow metal spatula to smooth the top and spread the icing until a little runs down the sides, then use a small, narrow metal spatula to smooth that icing over the sides. The icing on the sides should be thinner than that on the top. Remove the strips of paper by pulling each on out toward a narrow end. That looks absolutely divine! I was so tempted to give it a try, but it would have required getting groceries and I decided last minute to make a cake for a gathering I was going to. This one certainly looks worth coming back to though! 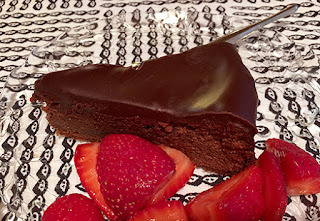 Your rich flourless chocolate cake with strawberries is amazing! What a decadent looking cake! I will have to try making a ganache with an alternative milk. I am glad you got such wonderful results. That did turn out pretty and so smart to serve it with some strawberries. The pop of color really adds to it. It's also great when everyone wants you to make a recipe again. I'm glad you had success with the cake! This month the choices were hard for me to choose from! This one sounded delicious, and I can see I was right! Mmmmm looks delicious. I haven't made a flourless chocolate cake in forever, so this was my choice too. After seeing your beautiful ganache I am second my choice not to make it too.